Perhaps our theme-park-free day yesterday recharged our batteries a bit but we were all up and about surprisingly early this morning. We left the house well before nine and made our way to our familiar breakfast haunt over on 192 to set us up for the day ahead. Despite warnings to the contrary, the weather was looking great this morning and we were soon bound for another visit to the Universal Islands of Adventure theme park to repeat those things that the kids most enjoyed (or missed because they were asleep) a week or so ago. We managed to get a really good parking bay in the multi-story car park. Other than having to take the lift one flight down, we couldn’t have been closer to the entrance - even if we’d paid for the preferred parking. After getting into the park, we made haste directly for the far side of the park to the Jurassic Park Island, where we let the kids run riot in the dinosaur exhibit. Joey had slept through our visit to this part of the park the last time around and we’d promised him we’d take him back to see all the dinosaurs. Even though the park was relatively empty, there was still a sixty minute wait posted at the Pterodactyl Flyer ride which I’ve always wanted to do but never had the patience to wait in line. Once again, we had to pass up on the opportunity to put that straight and carried on to the dino area. Both kids got a real thrill at seeing the dinosaur egg hatching and spent some time perusing the various hands-on exhibits there. We also wandered around the shop there a bit. Jennifer is great in the shops. She’ll readily grab anything that catches her eye off the shelves (pretty much anything and everything) but will just as readily put them back when we tell her to. Joey, on the other hand is a bit less predictable and always needs close attention. 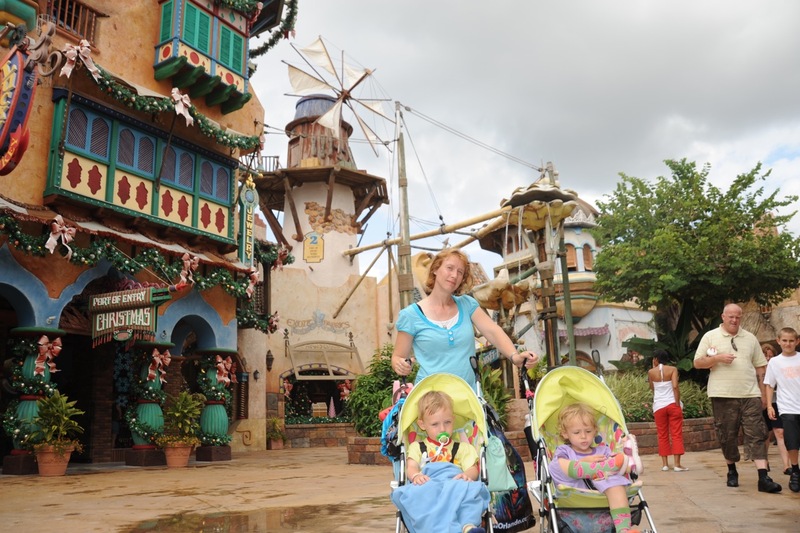 Having spent some time in Jurassic Park, we made a beeline for Seuss Landing, which is where we had the most luck keeping the kids entertained the last time around. We popped into some of the shops and took the opportunity to snap a few photos with the various characters that we spotted. The overhead train/people-mover thing was another big success - again. As was the case with all the other rides in the park today (except the Pterodactyl Flyer), the wait was pretty much non-existent. We took the kids into the Carasoussel another few times and again into the Cat and the Hat ride - again with no waiting in line. All morning, we’ve been making our way over towards the water play area in Seuss Landing. This is where the kids enjoyed themselves the most the last time around. By the time we got there, the clouds had formed and it was looking a bit ominous but we got the kids into the wet play clothes nevertheless. Just in time too, since the heavens opened up shortly thereafter. Since the kids were going to get soaking wet anyway, the downpour didn’t really faze us much. As is typically the case in Florida, the rain didn’t last terribly long and we soon had the cameras out snapping lots of great shots of the kids having lots of fun in the water. It was still very warm and both of them were having an absolute blast. By mid-afternoon, we got the kids all dried up and changed and we set off towards the park exit. Since there were no wait times on the major rides, we both had a go on the Incredible Hulk roller coaster and Sandy took Joey onto the Spider-man ride. As we approached the park exit, we were asked if we wouldn't mind taking part in a five-minute survey about our experience in the park. Sandy took the bait and spent a few minutes answering a few questions. The sun had come out again by this time and I was happy to stand in the air-conditioned room for a few minutes. As we made our way back to the car, we thought about trying to go back to Downtown Disney again but whilst we were driving along I4, the clouds were looking ominous again so we decided we’d take a drive over to 192 to see if we could find a restaurant for dinner. We found a Ruby Tuesdays in the end. When we finally headed home, there seemed to be a traffic jam on I4 so we tried to find an alternative route home. It took us a couple of attempts before eventually finding an appropriate back road and we made our way home eventually. We spent most of the rest of the evening bathing the kids and packing things up ready for tomorrow morning’s departure from the villa and the Orlando area.